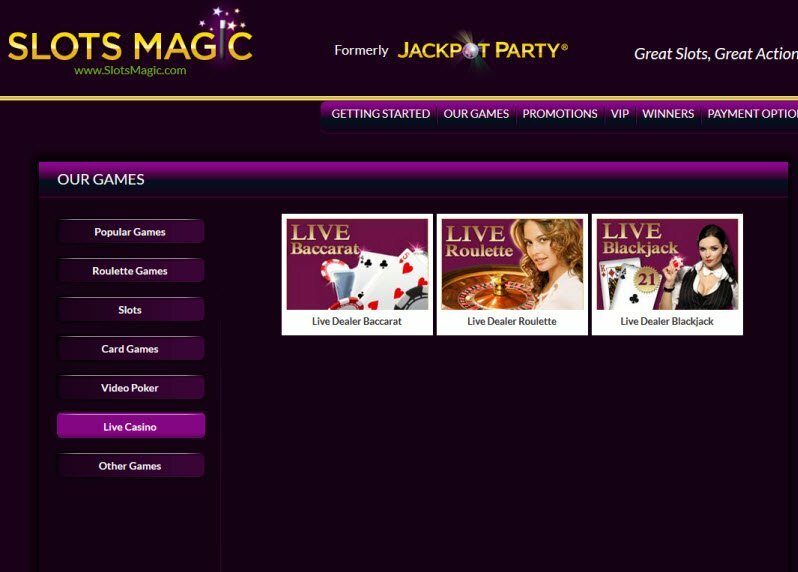 Formerly known as Jackpot Party, Slots Magic Casino offers the total package. Slots Magic Casino Games include all the most popular names in Slots, Table Games, Card Games, Video Poker, and Live Dealer from Williams Interactive Software and SkillOnNet. New players can enjoy the outstanding Welcome Bonus of £2,500 while returning players can cash in on the casino’s VIP program. Do You Believe in Slots Magic? Powered by Williams Interactive aka WMS Gaming along with SkillOnNet, Slots Magic Casino software stands out above the competition with its large suite of casino games. 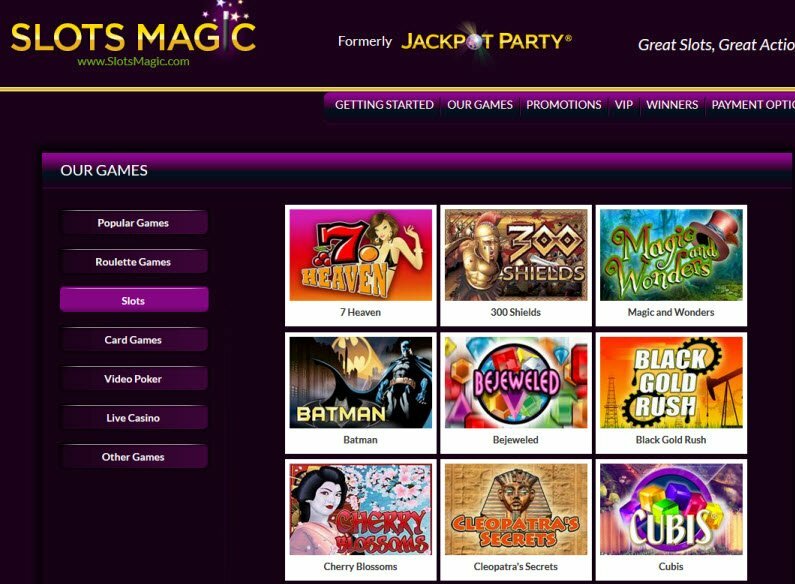 Gamblers can start playing Slots Magic Casino right away with instant play or they also have the option to download Slots Magic Casino software. When it comes to casino games, Slots Magic Casino pulls out all the stops. 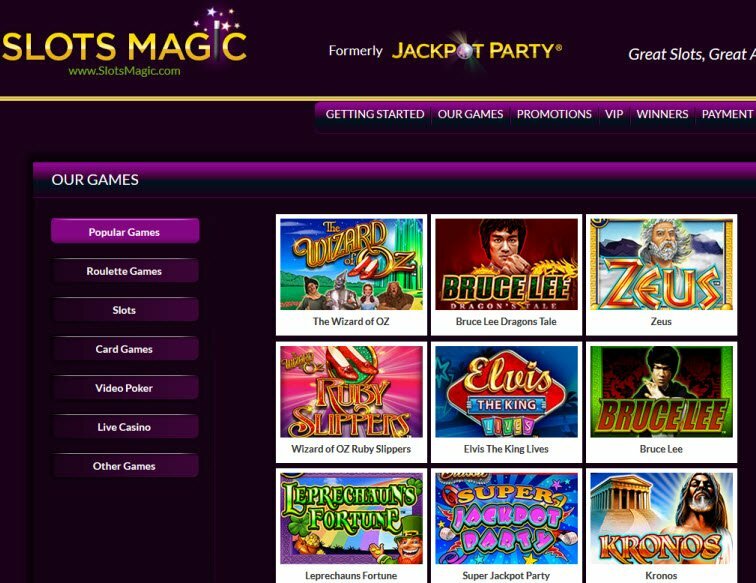 Slots Magic, of course, includes plenty of Slot Machines, but also offers Table Games, Roulette, Card Games, and Video Poker. For those who enjoy the thrill of a real casino, Slots Magic also includes Live Dealer Baccarat, Live Dealer Roulette, and Live Dealer Baccarat. Slots Magic Casino keeps a calendar stacked with promotions throughout the month that include Happy Hour specials, VIP Multipliers, and free money bonuses. The Slots Magic Casino Bonuses don’t end after the first 4 deposits. Slots Magic Casino keeps a calendar stacked with promotions throughout the month that include Happy Hour specials, VIP Multipliers, and free money bonuses. Slots Magic Casino offers a VIP Lounge so that loyal players can redeem prizes with the points that they accumulate. On top of it all, Slots Magic also has reload bonuses, races, and tournaments available to players. Now here’s the kind of gambling site that makes it especially convenient to place bets. Slots Magic Casino accepts a long list of well-known options for making deposits or withdrawing payouts. They also accept a handful of currencies including EUR, GBP, CAD, AUD, and ZAR. However, the casino does not accept USD. Slots Magic Casino doesn’t slack off when it comes to customer service. Their staff is standing by around the clock to answer your questions and ensure your online gambling experience is as easy as possible. The site provides phone numbers as well as email addresses to different departments so you can directly access the right staff member. They also provide an easy-to-use database so gamblers can read information about the casino. Unfortunately they do not offer 24/7 support in all of their languages. SlotsMillion Casino – Home to over 1,000 slots! Do they still not have a mobile casino? Thank you so much for your question. Unfortunately there is still no mobile platform for this casino. Take a look at this article https://www.vegasmaster.com/online-mobile-casinos/ to discover some of the best mobile casinos to play at.